I made the most awesome card for my son, I even had tears making it! My son was in the U.S. Marine Corp. as a Sergeant for the past 5 years. We only saw him once a year so to have him live here temporarily with his wife and dogs, is just heaven. This is a twisted Easel card, it is flat and shut right now. My papers are from 7 Dots and Bo Bunny. My image Joyful Noise by Mo Manning is colored with Distressed Inks and Aged Bronze Frantage is applied to the background. In our homeschool we read about the drummer boys in the Civil War and I was picturing this scene as I made the card. The main purpose of the drummer was to make a series of drum beats according to the orders given by their commanders, that way the soldiers could hear the commands over the guns and noise. Also the drummer boys carried the soldiers on stretchers so they could get medical help. When the boys turned 18 they could become a soldier in the Civil War. I made some trees out of the Memory Box die, Tall Birch. The music note above is a memory box die also and I Frantaged it with Aged Bronze. Then I used a pin and film strip to adorn the other side. I thought the pin was so appropriate for our loved ones in the Military. Here is a better look at the trees, they are just cut out of a scrap piece of designer paper that I had, the shading of the paper does it all. 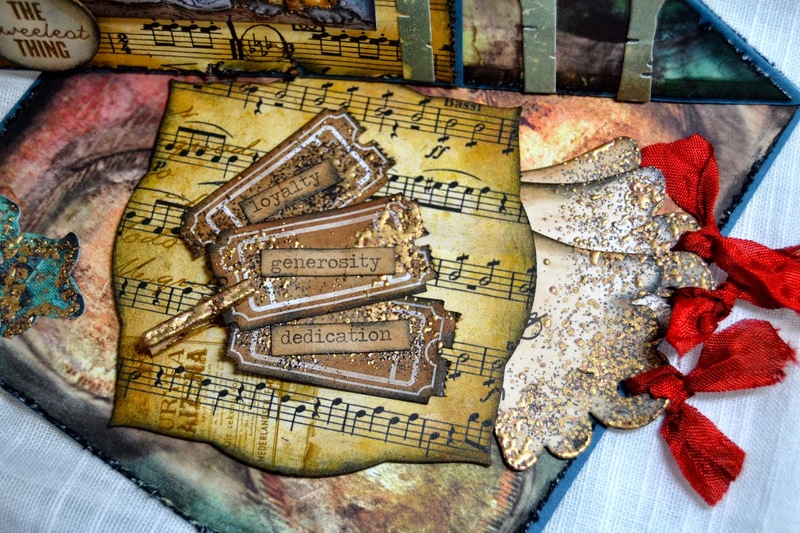 Here is the bottom where I used tickets and words from Tim Holtz for affirmations, then I held them together with a Frantaged clothes pin. 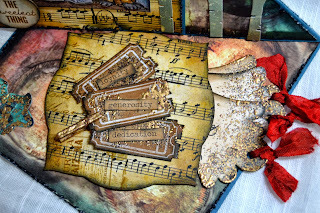 From the underneath of the music base are 3 Magnolia doohickey dies that are Frantaged and distressed. I hand wrote my notes to my son on them so he can pull them out and read them when he wants. So when I was photographing this part, he happened to be behind my shoulder and scared me when he said "Hey those have my name on them!" So I had to tell him about this card I made for him instead of surprising him properly. Here is another look at the side of it. All the papers are distressed with black ink and Vintage photo. This weeks Challenge at 7 Kids College Fund Blog is Anything Goes with a Twist of Vintage. I hope you make a creation to enter on the 7 Kids College Fund Blog so you can win their gift certificate towards a purchase at the store. Items from 7 Kids College Fund Store that are on my card. This is absolutely beautiful Kelly, it really is. And I love how special it is to you because it was made especially for you son. 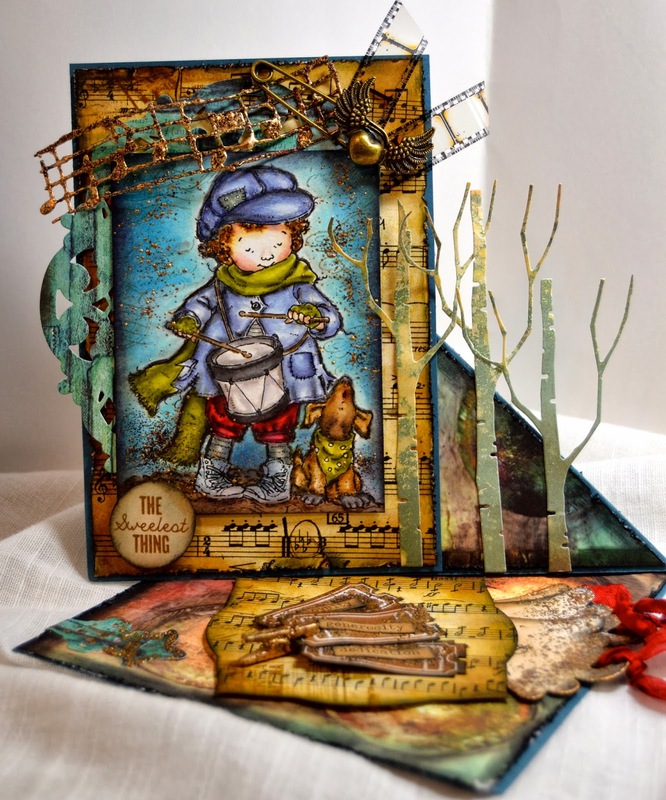 Oh wow Kelly, this is a jaw dropping gorgeous twisted easel design. There are just many beautiful details to feast the eyes on. Love it. WOW!! That is incredible and I never knew about the drummer boy. Very interesting. You did such an amazing job on this with all those details. Love the coloring too. Hugs! This card is touching, a superb creation again ! My God, your colouring is so fab, and all the frantage, the details, OMG, amazing !! Oh dear! Kelly this is an eye candy! LOVE it! Beautiful doesn't describe this creation Kelly, It's outstanding!!! I can see the love that's been poured into it. I'm so happy that your boy is back with you among his family. This is Soooo well done! Very detailed and you did put alot of work to it. Kelly, just stunning! I bet he will cherish this forever. Beautifully colored and adorned. Holy Smokes Kelly this is down right fabulous! So special in every way. The coloring and details are outstanding and I love the style! So much to admire and I'm sure your son will treasure this beauty! How precious to share such loving time together. Thanks for sharing the story of the drummer boys. And here's a salute to our veterans! Wow! Kelly! you certainly put magic in this special card! I just love the image you chose, and colored so beautifully. the shape of the card is outstanding, and all the lovely details out of this world gorgeous. You son will treasure! Fabulous work friend! Hugs. Good lord, girl, this is an exquisite work of art! I adore the sweet image and look at all those fantabulous details...WOW, WOW, WOW! 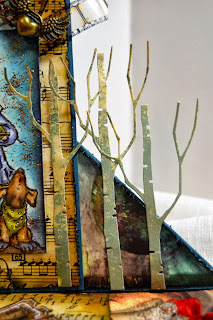 Love those gorgeous tags and all the bronze frantage........such a special creation and I know a lot of love went into this. He will treasure this, Kelly! stunning card! the coloring is amazing, and love the embellies! Such a special card for a special son. I love Mo Manning images. Congratulations to Scott - we are all proud of him. Our little boys do grow up in a hurry don't they! Wow wow wow Kelly! You already know how I feel about this card .. it's simply more than AMAZING! But when I read the story behind it .. it makes it so much more SPECIAL! This is a card that I know your son will truly treasure .. and I'm so happy that he is at home safe and sound with you. :) I'm looking at your card .. and no words can truly express how MAGICAL this is. Wowwwww! I absolutely LOVE LOVE LOVE it! Oh My WORD!!! how stunning is this??? I just love all of the details. Each time I look at it I see something else! And I really love the frantaged pieces. I know you are so proud of your son! I've been browsing so many delights... but just had to stop and gaze in joy and wonder at this one - magnificent, Kelly - I completely love it!